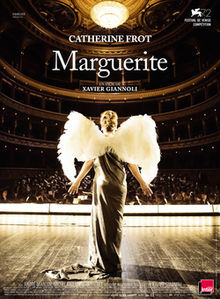 "Marguerite" opens in LA on Friday, March 11. “Marguerite” is a work of art, which takes the fascinating life of Foster Jenkins as inspiration and presents a story about love, dreams and illusions worthy of the world’s opera stages. Corsican director Xavier Giannoli wrote the screenplay with Marcia Romano and premiered the film at the Venice International Film Festival in 2015, where it was an official selection. Marguerite lives in 1921 France, near Paris, in a mansion where she hosts and performs at private concerts to raise money for charity. Despite her dedication and passion, she simply cannot sing. Her singing is so bad that actress Catherine Frot needed to lip-synch to a voice stand-in so that she wouldn’t harm her voice. But no one in Marguerite’s circle will tell her the truth, not even her husband. At the beginning of the film, Marguerite gives a typical laughable performance at a salon, but journalist Lucien Beaumont decides to write a positive review, one that furthers Marguerite’s illusions and sets a tragedy in motion. Without Giannoli’s comedy and poetry, the drama would be heartbreaking. Artistic brush strokes, like Marguerite’s squawking pet peacock and a giant eyeball from an opera set, add an almost-surreal quality to the film. Exceptional acting by Frot and the supporting cast, playing a plethora of interesting characters, along with beautiful scenery, costumes and cinematography, draw us into this dream world. Marguerite’s story unfolds in layers of artistry, including her driver Madelbos’ photographs and Beaumont’s writing. Marguerite collects costumes and props from operas and recreates scenes for Madelbos, a talented photographer, to capture the illusion of a career in opera. Beaumont mentions a book he is working on that, we can only assume, comes to fruition as the story we see on film, divided into chapters. Marguerite is no snob. She doesn’t act like a diva. She is an almost-naïve woman who loves singing and loves her husband, an unfaithful man who is, for years, quietly ashamed of her and doesn’t fully support her pursuit of a lifelong dream, until it’s too late. Touching and beautiful, “Marguerite” ranks among the best films ever made about classical music. Laemmle Playhouse, 673 E. Colorado Blvd., Pasadena 91101.